Coenzyme Q10 (CoQ10) Market size generated over USD 350 million revenue in 2015 and may witness gain above 10% CAGR. Strong application outlook in cosmetics and medical industry in Asia Pacific and EU should drive global CoQ10 market size growth. Increasing geriatric population base may fuel demand for anti-ageing creams and dietary supplements. It is widely used in the formulation of anti-ageing creams and sunscreen lotions owing to its qualities to prevent skin damage by free-radicals. The industry has witnessed emergence of cosmeceuticals companies over the last few years targeting skin care applications. According to United Nations report in 2013, global population may age at a rate of 11.1% to 18.6% from 2010 to 2040. Ageing population in the U.S., Japan, UK, Russia and China are driving anti-ageing creams demand. CoQ10 market is gaining recognition as an important ingredient in anti-ageing products owing to its antioxidant nature that eliminates free radicals. Coenzyme Q10 is also a vital component in the generation of biological energy that is required to promote skin repair. Increasing pollution and growing concerns regarding UV radiation effects on skin should stimulate sunscreen products demand. Positive application outlook for medical treatment in kidney failure, cancer, neurological diseases and periodontal should fuel coenzyme Q10 market size. It is used for the handling of various diseases such as cognitive illness and cardiovascular ailments. The product helps in repairing oxidative damages through anti-oxidation and limits plaque microorganisms from promoting periodontitis. According to studies conducted by Life Extension Foundation, the organization found that CoQ10 was instrumental in inhibiting the growth of PC3 cancer cells. A dosage of 390 mg daily along with conventional cancer treatment found to be effective by reducing tumor size and retracting metastasis. The test subjects showed 44% reduction in degeneration of motor skills, movement and mental function compared to patients who did not consume. WHO in 2013 found that around 14 million people were diagnosed with cancer in 2012 and the number may increase to 22 million by 2030. Positive outlook for nutritional supplements consumption in daily routine should drive coenzyme Q10 market size. Many companies are using CoQ10 as an ingredient in energy drinks and functional foods formulation owing to its anti-oxidant properties and ability to improve aerobic cellular respiration. 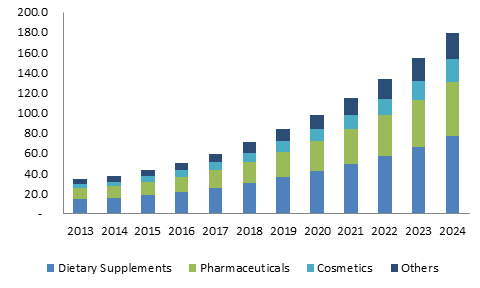 APAC, led by China and India market size, is set to witness significant gain owing to growing cosmetics and dietary supplements industry. Presence of high capacity coenzyme Q10 manufacturers in Japan along with SMEs in China should have a positive impact on APAC industry production. Lack of regulations in medical treatment may hinder industry growth and has enabled its manufacturers an advantage in terms of absence of manufacturing standards. Tight raw material supply in the form of peptone, hexane and tryptone may have an effect on CoQ10 market price trend. Also, exit of Japanese manufacturer firm Mitsubishi Gas Chemical in 2013 have resulted in decreased capacity in the market and shifted deficit demand to be fulfilled by other active manufacturers. This factor may also put pressure on coenzyme Q10 market price trend. Product recognition in the U.S. is limited to dietary supplements and is recognized as GRAS (Generally Recognized as Safe) for dietary supplements. FDA doesn’t recognize the coenzyme Q10 for any disease treatment due to lack of awareness regarding safety, daily dosage and effectiveness. Under the Office of Orphan Drugs Development, it is recognized for treatment of rare diseases that affect less than 200,000 U.S. citizens or 4,000 people per year. Dietary supplements market was valued at over USD 225 million in 2015. Rising health consciousness on account of increasing malnourishment levels should drive coenzyme Q10 market for dietary supplements application. The product has major usage in oil based capsules (soy bean and vegetable oil), hydrophilic gels, oral spray, tablets and power filled capsules. Intake of CoQ10 through dietary supplements helps increasing blood levels and reinforcing antioxidant functions which further prevents major diseases caused by cellular oxidative damage and metabolism disorders. Pharmaceutical applications should witness above average industry gains at over 9.5%. CoQ10 deficiencies are found in diseases such as cardiovascular, periodontal and cognitive ailments. Positive effects on migraine and Parkinson’s treatments should drive coenzyme Q10 market size in pharmaceutical industry. Cosmetics market may surpass USD 140 million by 2024. The product is used in anti-ageing or anti-wrinkle products, sunscreen lotions and moisturising skin care products. CoQ10 is available either in powder form or encapsulated in liposomes (nanoemulsion with 10% vitamin E). Liposomes are stable and enhance skin penetration effectively. North America, driven by U.S. CoQ10 market size, generated over USD 200 million revenue in 2015. Functional beverages and personal care products accounted for a major share in the U.S. industry. FDA recognizes the product as a primary dietary supplement. APAC, with cosmetic industry growth in China and India, may witness growth above 10% CAGR. Growing awareness regarding nutritional products along with rise in per capita disposable income should have a positive impact on the Asia Pacific coenzyme Q10 market. LATAM, with booming cosmetic industry in Brazil and Mexico, may drive coenzyme Q10 market demand. Rising disposable income with positive indicators for medical treatments, should drive product demand. Global coenzyme Q10 market share is concentrated with top four industry participants catering to over 50% of total demand in 2015. Kaneka, ZMC and Nisshin Sheifun are key industry players. CoQ10 market share also consists of Gnosis, Hwail Pharmaceutical, DSM, PharmaEssentia, SourceOne, Kyowa Hakko, Tishcon, Country Life, Pharmavite, NBTY and Vitamin Shoppe. Companies such as PharmaEssentia and Gnosis are suppliers and distributors to end users such as cosmetic manufacturers, dietary & nutraceutical manufacturer and pharmaceutical producers. These corporations have intergrated their process to decrease supplier cost and increase` profitability. Coenzyme Q10 aids in cognitive development of individuals and is found in humans drop with ageing. Adopting the product usage in daily dietary routine may prevent neurodegenerative diseases in older population. Promotes energy generation in cell membrane and is essential in metabolism of organisms. In addition, it is widely used in treatment of cancer, Parkinson’s syndrome and Huntington’s disease. In August 2006, Compound Solutions, producer and distributor of nutritional ingredients, has entered into a distribution agreement with Hangzhou Zhongmeihuadong Pharmaceutical, a subsidiary of Huadong Medical Group, to distribute CoQ10 products across North America and Europe.